A multi-million dollar logistics software company sits at the end of a narrow road, nearly hidden off Northwest 75th Street in Gainesville, Fla. If you’re not looking for it, there’s no doubt you’d miss it. The sign out front reads “OPTYM” in silver boxed letters. The building is a mix of concrete and wood paneling, with tall windows and a V-shaped roof. The intricacies of its exterior parallel the forward thinking that is going on inside — an incubator for solutions to everyday problems in the transportation industry. Optym, founded by President and CEO Ravi Ahuja, is a software company that provides decision automation and optimization scheduling solutions for airline, trucking, railroad and mining companies. The company considers real life transportation problems, formulates them as mathematical models with large number of variables (often in millions), solves them through sophisticated proprietary algorithms, and then packages the algorithms into commercial-grade software solutions. Its software solutions increase the efficiency and reduce costs of large, medium and small transportation companies. Ahuja started the company in 2000 when he saw a need for logistics software solutions in a railroad industry with a plethora of complex logistics planning problems. Optym has since grown from a few employees to more than 275 worldwide, with offices in Gainesville, Armenia, India, Australia and Chile. With revenue of about $25 million a year, it offers its highly skilled employees six-figure salaries. 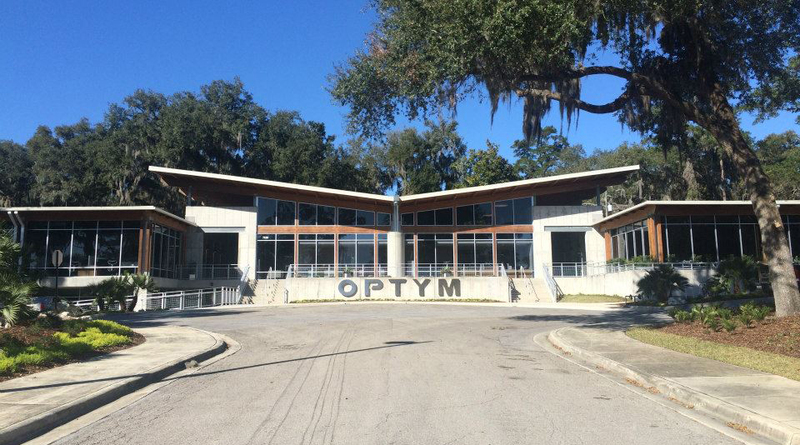 Optym expanded its Gainesville campus by 10,000 square feet in August. Ahuja said the company should grow to more than 500 employees in the next five years. Southwest Airlines uses Optym’s sky software to optimize its thousands of scheduled flights each day. The airline industry is Optym’s biggest grossing area. But Ahuja, an academician turned entrepreneur, doesn’t take credit for what he’s started in Gainesville, a town that has grown into one of the largest technology hubs in Florida. He calls it “our company” always and didn’t slip once in a 20-minute interview with Gainesville Magazine. He agreed to the interview on the terms the story focus on his team and not himself. A group of men sit at a round desk with about a dozen computers, typing away on their keyboards. Surrounding them are equations on white boards. These men, developers for Optym, all look no older than around 25, some with scruffy beards and others clean shaven, a look like they’ve just stepped out of a barbershop or fraternity house. On their screens are strings of numbers, complex algorithms — the secret sauce to what makes Optym’s software so successful. The real life scenarios can include issues like package, airline and railroad delays. The algorithms are then incorporated with Optym’s solutions software. Each algorithm is different, depending on the industry and company, and Optym developers often customize the software to best meet the needs of its clients. Kory Harb, a business analyst at Optym, has the job of meeting with clients to determine what their problems are and reporting back to developers. “We have to understand what problems there are to solve in these industries so we can use our tools or build tools to solve the problems,” he said. Harb said the costs the software is saving Optym’s clients can be represented as total savings on fuel because of more efficient routes or in the form of more happy customers because their packages arrived quickly. Harb, one of the few Optym employees without a doctoral or master’s degree, said he enjoys working with his mentors and solving complex problems. Despite its worldwide reach, Optym has been working to help the “small guys” in the industry as well. Jim Handoush, Optym’s executive vice president of transportation and logistics solution, has been working on marketing and adapting Optym’s software for trucking owner-operators, which are smaller operators that either have one truck or under 20 trucks in their fleet. Owner-operators represent 90% of the trucking market, Handoush said. He said Optym’s logistics solutions have been proven at large trucking companies, so Optym helping out the smaller ones while extending its reach is a win-win. Optym is working to help out locally as well. Sam Ahuja, Ravi’s son, Optym’s marketing director, creates marketing tools used to pitch potential clients. He’s recently been in contact with Gainesville city officials with talks about optimizing traffic lights in Gainesville by using Optym’s software. “We have a huge traffic problem in Gainesville,” Sam Ahuja said. Optym’s marketing team is also meeting with officials about improving bus route scheduling for Gainesville’s Regional Transit System. It’s currently working with the Gainesville Area Chamber of Commerce on rebranding and updating its website. Ravi Ahuja is a friendly man with passion in his eyes. Born in western India, he studied industrial and management engineering from the Indian Institute of Technology. Before creating Optym, he taught at the Indian Institute of Technology Kanpur and the Sloan School of Management at Massachusetts Institute of Technology. He is currently a professor at the University of Florida. “I went from professor to a sales person,” he joked, adding in early years of Optym, he was its one and only sales person. Amanda Crawford, Optym’s office manager, said Ravi Ahuja has an open-door policy. Sam Ahuja says his dad has always been that way. Ravi Ahuja, the family man, salesman, entrepreneur and CEO said he has built something he’s proud of at Optym but believes the company has only reached 5 percent of its potential. “You’re never completely satisfied; if you’re satisfied, you stop growing and life’s a journey,” he said. “I want our company to reach its full potential. I will be satisfied when our algorithms are driving all transportation operations. To get there, he said his marketing teams will continue to sell their products, his developers will continue to fortify them and leadership will continue to put them in the best positions to succeed.